The texture of these cranberry orange scones is phenomenal - billowy soft and crumbly. And they are not overly sweet. Preheat oven to 400˚F. Line a large baking sheet with parchment paper. In a large bowl, stir together 2 1/2 cups flour, 2 Tbsp sugar, 1 Tbsp baking powder, 1/4 tsp salt and 1/2 Tbsp grated orange zest. Add butter pieces and using a pastry cutter (or 2 knives), cut butter into mixture until you have coarse pea-sized crumbs. Toss in 3/4 cup dried cranberries and stir gently to combine. Make a well in the center and set aside. In a medium bowl, whisk together 2 eggs and 1/2 cup heavy cream. Pour egg mixture into the flour mixture and use a spatula to stir just until moistened. Turn dough out onto a generously floured surface and pull it together into a round disk, about 3/4" thick. Cut disk into 12 equal wedges and pull apart slightly. Brush tops of scones with 1 Tbsp heavy cream and sprinkle with raw sugar if desired. Bake 15-17 min until golden (mine took 16 min). 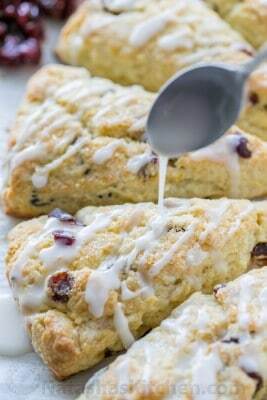 Remove scones from the hot baking sheet and let cool 15 min then whisk together 2/3 cup powdered sugar and 1 Tbsp freshly squeezed orange juice, adding more or less to desired thickness then drizzle over scones.